Christopher passed Eric Beers, Rick Fuller and Jamie Tomaino to get near the front and then liked what he saw ahead of him. “I said ‘let them dice and I’ll make it a three way battle,” said Christopher of seeing Coby and Hossfeld racing for the lead. Meanwhile, Hossfeld now had to worry about what was in front of him and behind him. For the next 118 laps, Coby pulled away to a monster lead. 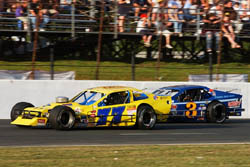 The Haynes 150 NASCAR Whelen Modified Tour race at Stafford Motor Speedway (CT) was a tale of two races. 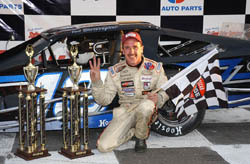 The second act, was what most everyone was talking about on the ride home was the spectacular final 10 laps where Ted Christopher came out on top of a great three-way battle with Chuck Hossfeld and Doug Coby. It doesn’t getting much better than that. Unfortunately, it doesn’t usually get any worse than the first 140 laps at Stafford. 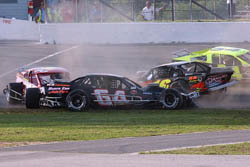 Most of the race was a ugly wreckfest with several multiple-car wrecks and two red flag periods. Even veteran drivers were scratching their heads after that one. 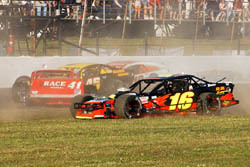 Three former Modified Tour champs were befuddled when they were asked why the day was so ugly. Doug Coby had an easy way to deal with all of the rough driving though – he stayed ahead of it for most of the day. The driver of the Curt Chase-owned #77 took the lead from Eric Beers on lap 25. After Christopher motored on by, he rolled to the checkered flag and ended a drought of sorts, at least by TC standards. His Modified Tour victory was the first one at Stafford since 2003. The victory also helped Christopher add to his Modified Tour points lead. TC left Stafford with a 103-point advantage over Hossfeld. Hossfeld got by Coby with seven laps to go, but three laps later it was Christopher’s time to get under Hossfeld and take the lead. Coby didn’t pit for tires either. Had the race gone green at the end, it was unlikely that anyone would have caught him. But with ten laps to go and the field bunched up after a caution, it was obvious that there was going to be a good race to the finish. Chuck Hossfeld was sitting in second place. He looked under the #77 of Coby to take the lead. That didn’t work. He tried going high. That didn’t work either. The door opened for Hossfeld with seven laps to go when Coby drifted a little bit high and Hossfeld took over the lead. Meanwhile, Christopher was sitting outside the top five with a dozen laps left, but he was also sitting on fresher rubber. “I knew that everyone else had pitted early, so when it got to be 30 to go and I had new tires I knew that I’d carve these guys up,” said Christopher. “I’ve done that before here with probably 10 laps to go. 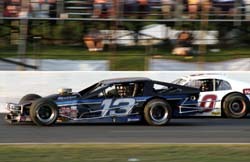 Speed51.com will have more from Stafford with our Modified Leftovers later in the week.